The following is the original manuscript. I was in need of technical support for my blog this week. So I sent an email to the blog provider describing the problem. I was then contacted by someone in tech support who identified himself as a “happiness engineer.” Isn’t that great? Do colleges offer that degree now? Man, I studied the wrong thing in college! I majored in electrical engineering, but happiness engineering sounds like much more fun. I don’t know… that sounds like a degree that that number one party school over in Athens might offer, huh? I’m kidding! But can you imagine the electives? What fun! I used to listen this E.G. 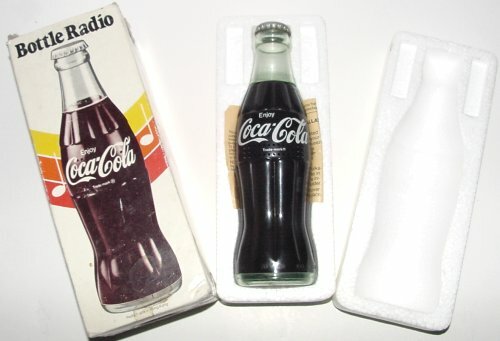 Marshall-hosted radio drama on a handheld Coke-bottle-shaped radio when I was a kid in the ’70s. WSB Radio broadcast it. (Yes, there was a time when AM radio wasn’t just political blow-hards 24/7.) Mystery Theater was a revival of radio drama in the age of TV. I fell in love with it. Thanks to a friend who gave me several DVDs worth of episodes on mp3, I’ve been listening again. I like this episode. I know it’s dated: we no longer live in the Cold War era, and most of us don’t fear nuclear annihilation (although we fear plenty of other things). And it’s heavy-handed (the way these Twilight Zone-ish sci-fi stories tend to be) as it knocks the listener over the head with its message of love. But more than anything it speaks to our deep and persistent longing for God. I’ve recommended this book to and purchased it for people who want to know more about the Christian faith. Here’s a nice excerpt I re-read this week that speaks to me. I’m going to reflect on these ideas (and others) as I deliver my upcoming four-part sermon series on salvation. † N.T. Wright, Simply Christian: Why Christianity Makes Sense (New York: HarperOne, 2006), 207. Last Tuesday, Stephanie and I had the privilege of performing music for “54 and More,” our church’s senior adult fellowship group. What a warm and gracious audience they were! When Jerri Davis, the emcee of the event, introduced us, she said, “Brent and Stephanie are down in Vinebranch on Sundays.” At the end of the program, I gently corrected her, saying that starting today, we are no longer down in Vinebranch.” We’ve all been saying, “down in Vinebranch,” so long that it’s going to be hard to change the way we refer to it. But starting today, we are no longer down anywhere—down in the basement, down in the dark, without windows and sunlight. We have moved up to Main Street. We have a prominent location, a beautiful sanctuary, and a beautiful building that blends the best of old and new. Back in the good old days of the internet, before the advent of the World Wide Web—not to mention Facebook—when the internet was confined to ASCII text on mainframe terminals, we Georgia Tech students used to have heated arguments called “flame wars” with other academic types around the world on Usenet newsgroups. Today I relived a little bit of that spirit in a thread on Facebook related to Christianity. Someone posted a link to an article talking about how American Protestantism—given its checkered history with slavery, violence, and warfare, etc.—is really the most dangerous religion in America (not Islam). This video was shown in Vinebranch on August 22 as part of our celebration of the newly renovated chapel. 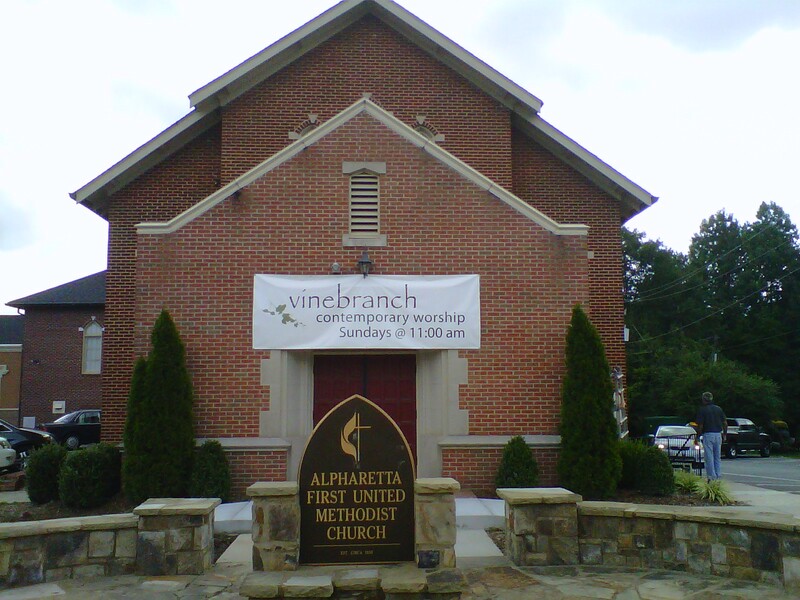 Don’t forget that this Sunday, the Vinebranch worship service will be moving into the newly renovated chapel. The interior of the chapel has been redesigned from the ground up for Vinebranch, with a clean, contemporary feel. Most of the technology required to run the service is “under the hood,” hidden from view. It’s been engineered to make optimal use of sound, lighting, and video. But it also honors the past with its beautiful stained-glass arched windows and gothic exterior. Just as it was when it was completed in 1938, the chapel will once again be a sanctuary for weekly worship—during which songs of worship and praise will be sung, the Word of God proclaimed, and the sacraments administered. Our sermon is entitled “On This Rock,” and the scripture is Matthew 16:13-18. We will celebrate Holy Communion. This is beyond trivial—not to mention ancient history—but for reasons I can’t explain I was mesmerized by this clip from the making of “We Are the World,” in which Daryl Hall for some reason can’t stop looking at his music—even though he only has one short line! And it’s not like he’s reading the music because he sings it differently each take! But he’s not nearly as bad as Kim Carnes. Huey Lewis must be a genuinely nice guy, because notice how patient he is with her as she continually fails to stay on key. Steve Perry is the real hero here, though. He changes the phrasing and vocal melody each time through, but whatever he does sounds perfect. He’s so nonchalant about it, too. Isn’t that exactly what God (through Jesus) doesn’t do during the wilderness temptation? Moses gets water from a rock, but Jesus refuses to turn stone to bread—because, as he quotes from scripture, we human beings don’t live by bread alone. Someone with more time on their hands should probably reflect on the irony in this mistake—as it relates to the nature of temptation, celebrity, and greed, etc.—but that’s not me. Not that I credit Michael Jackson or Lionel Richie (who wrote those words?) with being Bible scholars, but I’m genuinely surprised that that mistake slipped through. My first thought is that the Wall Street Journal must have had some space to fill! There is very little substance here. Notice that the author, Brett McCracken (who has a blog here), doesn’t cite any evidence that young people either like or dislike these recent church trends that he criticizes. Young adults may be fleeing church in droves (I doubt that’s anything new), but it’s hardly because of what people like Rob Bell and Mark Driscoll are doing. I can’t say, but neither can McCracken. The long and short of the piece is, “I’m 27 years old, and I don’t like it. I can speak authoritatively for my generation.” He’s also able to see into the hearts of pastors and worship leaders who have edgier sermon topics and music, and who take advantage of the latest technology. He implies that they’re acting in bad faith: they’re only doing these things to attract young people, not because they really believe in the messages they’re communicating. How does he know? Since I only have a passing knowledge of Rob Bell and Mark Driscoll (who are very different from one another), I have no idea to what extent I “agree,” theologically, with either of them. But I have no reason to doubt that, like most pastors, they’re sincerely doing the best they can to share the good news of Jesus Christ with people who need to hear it. By all means, we worship planners—especially those of us who are involved in something usually called “contemporary worship”—don’t want to pander. We don’t want to chase after a demographic. The questions we need to ask are the following: “Are we being faithful to the gospel in the messages that we communicate? Are we leading worship with integrity? Do we really mean the words that we say and sing and pray?” If we answer these questions “yes,” what does it matter what style or form worship takes? As someone with otherwise strong opinions about liturgy and tradition, I’m almost surprised to read that last sentence, but that’s what I believe! After all, regardless of our best and most thoughtful worship planning, the Holy Spirit enables true worship and makes it effective. It’s not ultimately up to us. Didn’t Paul say something about that? “I planted, Apollos watered, but God gave the growth” (1 Corinthians 3:6).